Critical thinking is an essential skill in the cognitive development of students. It is probably the number one skill teachers would mention when asked about the skills they target in their instruction. Critical thinking is also the key to developing other equally crucial thinking habits such as divergent, lateral and convergent thinking. Critical thinking starts with asking and answering critical questions. By critical questions I mean those questions that enable students to categorize, infer, synthesize, evaluate and apply the knowledge they have accumulated in the past to solve existing problems and learn new information. This is a well thought-out process in which students get to challenge their cognitive capacities and explore novel thinking paths. 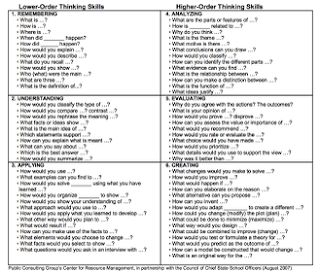 Looking for some samples of critical thinking questions to use in class with your students I come across this wonderful resource from Curriculum Institute. This is basically a short 4 pages PDF titled: Bloom's Critical Thinking Cue Questions. 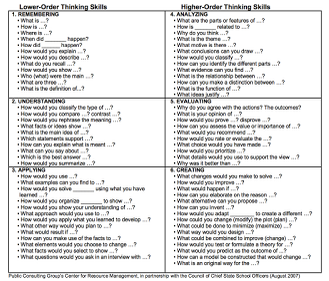 In page 3 there is this illustrative chart which features a set of cue questions based on Bloom's taxonomy of critical thinking. This could be a very good guide to use in class to target different thinking levels of your students. Check out the original chart in page 3 of this PDF.